KATHRYN O’SULLIVAN on Awards, Grisly Moments, and Mustangs + 2 Book GIVEAWAY! 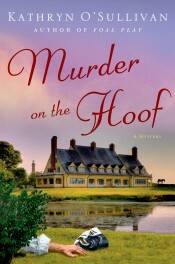 Murder on the Hoof picks up a few weeks after the events of Kathryn’s debut novel, Foal Play. It’s mid-August and Fire Chief Colleen McCabe is conducting rookie training and spending increasingly more time with her best friend, Sheriff Bill Dorman. The wild horses have been relocated to the sanctuary, and the town is occupied with the upcoming local theater production. All is right with the world. But when a member of the acting troupe is found dead and Bill’s ex-fiancee arrives in town with a film company, Colleen knows trouble is back with a vengeance. Colleen is forced to put aside her feelings about her relationship with Bill and work with him to uncover who is murdering the thespians and why … and quickly discovers as much drama offstage as on! Kathryn has a treat in store for you. She’s giving away signed copies of both Foal Play and Murder on the Hoof to one lucky winner! (Details at the bottom of this post.) She elected to take the Deb Ball interview. Welcome, Kathryn! 1. Your first novel, FOAL PLAY, won the 2012 Malice Domestic Best First Traditional Mystery Novel Competition. What a thrill! How much did that rock your world? And did you feel extra pressure as you wrote your second novel? Winning the Malice Domestic competition has changed my life in many amazing ways. When I received the phone message from Toni Kirkpatrick at St. Martin’s Press that I had won, I didn’t hear her correctly the first time I listened. I thought she had said that I was a finalist. I was so thrilled. Time to celebrate! Then when I replayed the message I realized she had said that I had won the competition. I was stunned. Definitely a world rocking moment that I am grateful for and remember every day. What a joy it is to be a part of a community of writers who plot murder for fun! As for feeling pressure as I wrote MURDER ON THE HOOF… I’d be lying if I said I didn’t. I want readers to enjoy the second book as much as they enjoyed FOAL PLAY. I read their comments and emails about FOAL PLAY with great consideration and tried to keep elements that they enjoyed and made note of those they didn’t. I had one reader email me that she didn’t like the tone of the prologue in FOAL PLAY – too grim for her – but that once she got past those pages she really enjoyed the book. I thought, “Note to self, no grisly moments in a cozy!” Others wrote that they hoped to learn more about Colleen in future books so in the second book readers get a peek into Colleen’s personal life and how it gets in the way of her sleuthing. 2. Tell us a secret about your main character, Fire Chief Colleen McCabe – something that’s not even in your book. Anyone who knows me well knows that a lot of me is in Colleen McCabe, although I think she is far more courageous than I am. Here’s a secret that isn’t in the books because Colleen would never admit it, not even to herself: On some level she secretly enjoys her encounters with Antonio “Pinky” Salvatore, the charming, successful Corolla real estate developer. Colleen attempts to discourage Pinky and downplays her looks so as to be taken more seriously in her job as fire chief, but Pinky unapologetically persists in his romantic advances. And, despite her denials, Colleen’s best friend and love interest, Sheriff Bill Dorman, knows Pinky’s advances aren’t entirely unwelcome. 3. Has anyone ever thought a character you wrote was based on them? All the time! Many of my characters are based on or inspired by people I know or have known — although I tend to exaggerate qualities and flaws to make it fun. I write each and every character with love, even when I make them the unfortunate victim of a killer. If you suspect you’ve made it into a story of mine, take it as a compliment. It means I think you’re a fascinating human being. Who wants to base characters on people who aren’t interesting? 4. Your series features the real life wild Spanish mustangs of Corolla, North Carolina. What led you to center your series around horses and these horses in particular? I fell in love with the Outer Banks, and Corolla and its wild horses in particular, years ago when I was a teenager and my family vacationed there. Back then, the horses roamed free and it wasn’t unusual to see them grazing on dune grass next to your beach house. The ocean breeze would blow through their manes as they strolled across the dunes and I thought that was pure magic. For their protection, the horses are now relocated to an area just north of Corolla. If you get a chance to visit, you should definitely take a tour with one of the patrol officers at the Corolla Wild Horse Fund. You’ll learn about the horses and their habitat and the money for the tour goes toward helping protect the endangered herd. I can’t imagine writing the series without their presence but readers shouldn’t expect a lot of characters interacting with the horses. There’s a law against coming within fifty feet of or feeding them, and I wanted to honor that. The horses of Corolla are wild and free. I hope they continue to stay that way. I am currently working on the third book. I’d love to keep writing the Colleen McCabe series as long as readers want to read it. I will also be working on the third season of THURSTON, my Western web series. After that, I have ideas for a thriller, a romance series, and a science fiction novel I’ll co-write with my husband. 6. What’s your advice for aspiring writers? My experience is proof that writing competitions are worthwhile and that you must send out your work. Before winning the Malice Domestic competition, I didn’t have a single connection in the publishing industry. Now I am writing my third novel, work with an incredible team at St. Martin’s Press, and have a wonderful agent. I tell this to my students all the time … You must send your work out because nobody is going to discover your brilliant book or short story or play or screenplay if it stays on your computer or sits buried in a drawer. If you don’t succeed the first (or second or third) time, send it out again and begin writing your next work. You will become a better writer with every story. And the more you write, the more you’ll discover your unique perspective on the human experience and how to share that with readers. Just keep writing! What places have you fallen in love with? Do they still inspire you in any way? GIVEAWAY! Comment on this post by noon EST on Friday, May 9th, and you’ll be entered to win signed copies of both Foul Play and Murder on the Hoof. International contestants welcome. Follow The Debutante Ball on Facebook and Twitter for extra entries—just mention that you did so in your comments. We’ll choose and contact the winner on Friday. Good luck! Kathryn O’Sullivan’s debut FOAL PLAY was winner of the Malice Domestic Best First Traditional Mystery Novel Competition. MURDER ON THE HOOF is the second book in the series featuring feisty Fire Chief Colleen McCabe. 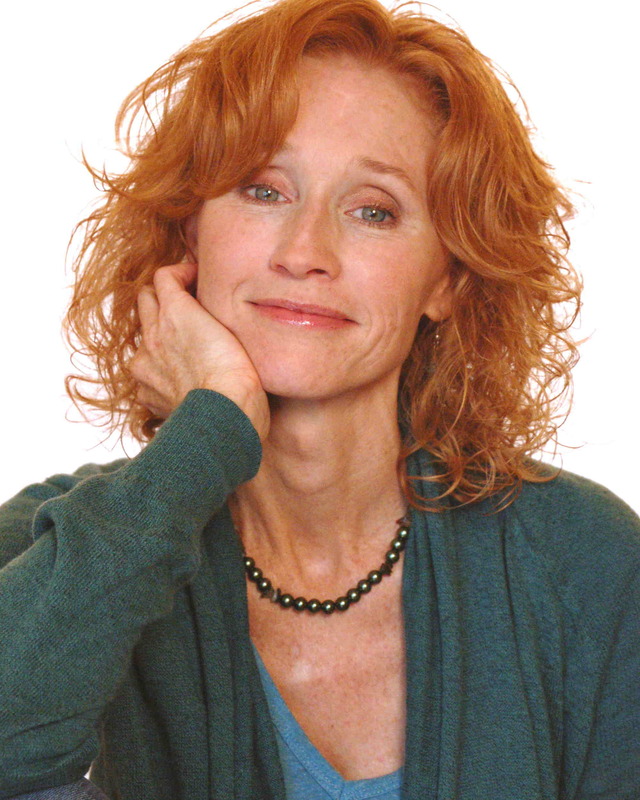 O’Sullivan is a playwright, co-executive producer/creator/writer of the award-winning Western web series THURSTON (www.thurston-series.com), and a theatre professor at Northern Virginia Community College. She lives in Virginia with her husband, a director and cinematographer, and their rescue cat, Oscar. Numerous places have inspired me over my life. Every place seems to have it’s own character, history and beauty. So picking one is not easy, but….. Charleston, South Carolina inspired me when I first went down there to visit my now husband when he was attending The citadel. Going in the spring added to the beauty, with magnolias and azaleas in full bloom. Then the people were extremely friendly and proudly introduced me to many places that made up the city’s history. It inspired me because of it’s growth and change to such a wonderful place after a checkered history. The restaurants, community theater, city market all intrigued me too! But this is just one city amongst many that has blessed my life!! I have heard lovely things about Charleston. Your post makes me want to visit. Isn’t it wonderful when we finds such gems?! Thanks for posting! Many years ago when I had the opportunity to travel to The Rockies in Canada, I was captivated by the stunning magnificence of these mountains and the beauty of the blue skies and glacier lakes. I had never experienced such scenic vistas and this definitely was inspiring and unforgettable. Nothing could surpass this and I knew that someday I would live near or in the west since it made such a deep impression upon my heart and soul. The power of nature to heal us and fill our hearts and souls is amazing, Diane. Thanks for sharing. I grew up in South Florida, and despite having lived in a number of other places over the decades it still is the only place that truly feels like home to me! There has been more than one place that has inspired me, but the one that inspires me daily is the church where I am blessed to be the Church Secretary. I am following The Debutante Ball on FB. I really also enjoyed the interview. My first ever international trip gave me a new perspective on fascinating and historic locales. I was spellbound with Italy and the beauty, history, romance and culinary delights. Even though this was a brief trip and a small part of the country was visited it deeply affected my outlook. I live in a unique setting which is old and interesting. Perhaps one day the ocean will be where I will live. The ocean and beach are inspiring and allow me to dream. I went to Spain several years back, Annie, and completely understand your feelings about international locales. And I totally agree about the ocean and beach! That’s one of the reasons I set the book in Corolla! When I was a child, my family would watch a movie called “The Gnome-moblie”. Part of the movie was set in the Redwood Forest. As an adult I took a drive through the Redwoods with my husband. It is an amazing, awe inspiring place. No wonder there is a movie about magical creatures set there! We even discovered a local magical creature- the chipalope (it’s a chipmunk and an antelope combined). Our oldest was one at the time and we bought her a little stuffed chipalope that is still a favorite toy. It’s fun to be able to bring a bit of the “magic” home with us. What a sweet story. I can only imagine what the Redwood Forest must look like. From pictures, it feels like a place from another time. Thanks for sharing! ……should be good…..btw, I follow Debutante Ball on FB(Rakib Khan) and on twitter(@ihate_00)….. Thanks, Rhonda, Rakib Khan, and JJT for coming to The Ball! Hope you enjoy! The plight of wild horses breaks my heart. That’s one of the reasons I am so happy you’ve written about them…let’s hope you sell tons of your books to increase awareness of these special creatures! It is heartbreaking, Hannelore Cheney. The Corolla horses are endangered and the Corolla Wild Horse Fund has twice had bills pass in the US House of Representatives… only to have the Senate fail to vote. I hope in some way my books bring visibility to their plight. Thank you for your thoughtful comment. I love mysteries based on different locations throughout the world. It’s interesting to learn about the people while becoming absorbed in the mystery. I especially love stories based in Ireland, Scotland and England. I have never traveled to these places, so I get to learn about them through reading. I like to go to the area around the Smoky Mountains, it’s very peaceful in the mountains and a calm surrounds me, I would like to see some stories based here. I’d like to see the UK, too. I love your comment about how a calm comes over you in the mountains. That’s how I feel about the ocean/beach. Thank you for sharing! This looks awesome! It’s definitely going on my reading list. Thanks, Jennifer!!! Hope you enjoy!!! I’m such a numbskull. When I met you at Malice, I totally didn’t connect that you were our guest here this week. Nice to meet you!